Fifty-five Palestinian protesters, including six children under 18, have been killed by Israeli fire during demonstrations on the day of the US embassy's inauguration in Jerusalem, the Palestinian health ministry said Monday. 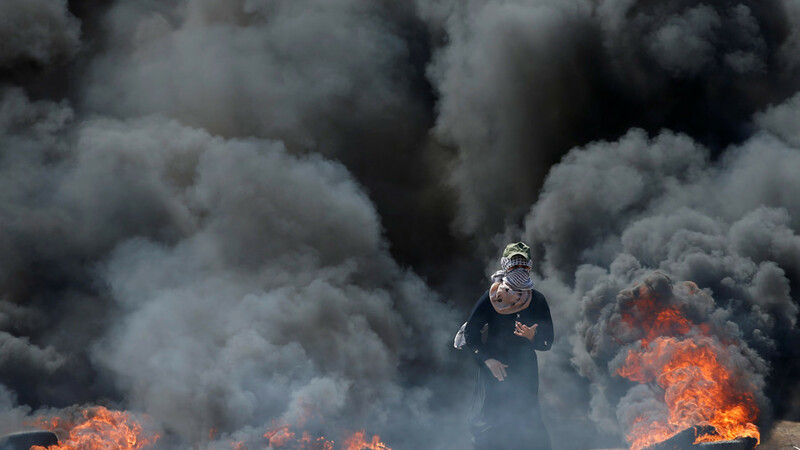 The Palestinian government denounced Monday's violence as a "terrible massacre" perpetrated "by the forces of the Israeli occupation", and called for an immediate international intervention to prevent further deaths. A day of national mourning has been declared by the government in Ramallah, to be held Tuesday. 5اطفال دون سن ال 18عام. Amnesty International has called the Israeli violence in Gaza "an abhorrent violation of international law & human rights." [Ron: BUT NOT A HOLOCAUST!!!]. We are witnessing an abhorrent violation of international law & human rights in #Gaza. 38 confirmed dead, including 6 children, with close to 2000 people injured. Many are reporting injuries to the head and chest. Over 500 injured with live ammunition. This must end immediately. [Ron: Yabba, yabba, how many more times will this be said, yabba.]. Six journalists have reportedly been injured while covering Monday's demonstrations, according to the Journalist Support Committee. [Ron: Translation: ANY Palestinian NEAR the Palestinian side of the unlawful "security fence" IN GAZA is by definition "A TERRORIST" and assumed to be attempting to DAMAGE JEWISH PROPERTY, ie the Fence. So of course the Jews are entitled to KILL them. Any Questions...?]. Dr. Mkhaimer Abuseda, professor of political sciences at Alazhar University in Gaza, told RT that the relocation of the US embassy from Tel-Aviv to Jerusalem is "a very sad day for the Palestinians, reminding them of their first Nakba some 70 years ago." "It seems to me that the Palestinians have decided that the US is no longer an honest broker in the MidEast peace process between the Palestinians and Israelis," he said, adding that it will likely lead to further Palestinian rage and resistance. Turkey's Deputy Prime Minister Bekir Bozdag has condemned Monday's violence, claiming the US, as well as Israel, is responsible for the "massacre" because of their "unjust decision" to move the embassy. 6)Bu katliamlardan dolayı İsrail'i ve aldığı haksız/hukuksuz kararla bu hadiselere ve ölümlere neden olan ABD yönetimini kınıyorum. Kudüs'ün tarihi,manevi ve akdi statüsü,oldu bitti ile değişmez/değiştirilemez. The IDF dropped leaflets warning people in Gaza to stay away from the security fence ahead of Monday's protests. 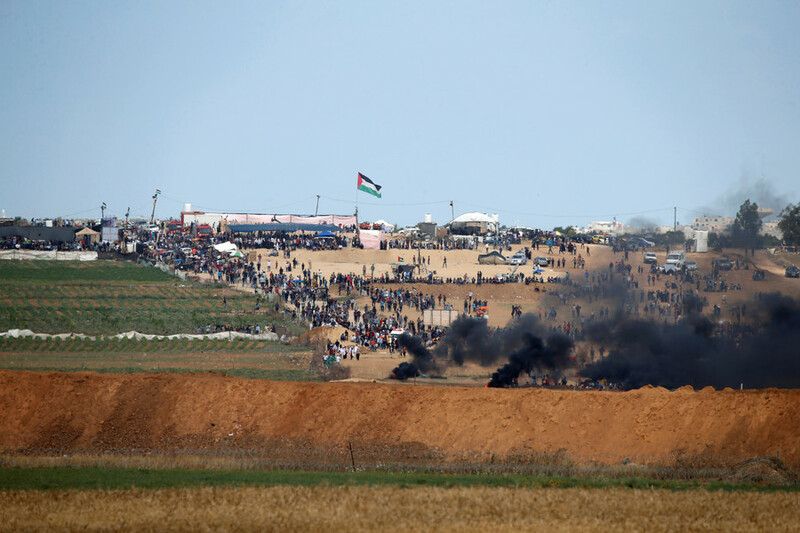 Demonstrators in North Gaza brought down an IDF drone that was allegedly dropping fire bombs on tents, according to the Great Return March movement. [some Colour fonts, bolding and comments in square brackets added. ].